It's time to pick a side in Battle Yahtzee Alien vs Predator!A Players assume the character of Predator, Alien, Marine or Scientist and attack their enemies with classic dice roll combinations like Full House and Large Straight. Featuring glow in the dark dice, Battle chance die, custom scoreboards, and special powers for each character. Battle Yahtzee Alien vs Predator is an epic battle for survival! Last player alive wins the game! Officially Licensed. For 2 or more players. This item can only be shipped to North America - No exceptions! It's time to pick a side in Battle Yahtzee Alien vs Predator! Players assume the character of Predator, Alien, Marine or Scientist and attack their enemies with classic dice roll combinations like Full House and Large Straight. Featuring glow in the dark dice, Battle chance die, custom scoreboards, and special powers for each character. 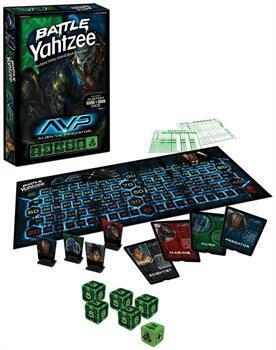 Battle Yahtzee Alien vs Predator is an epic battle for survival! Last player alive wins the game!